Sierra Wireless, Inc. (NASDAQ: SWIR) (TSX: SW) today reported first quarter 2012 results. All results are reported in U.S. dollars and are prepared in accordance with United States generally accepted accounting principles ("GAAP"), except as otherwise indicated below. Revenue for the first quarter of 2012 was $150.3 million, an increase of 4% compared to $144.3 million in the first quarter of 2011, and an increase of 2% compared to $147.2 million in the fourth quarter of 2011. The year-over-year revenue increase was driven by growth in both our M2M and Mobile Computing lines of business. M2M revenue was $77.0 million, up 6% compared to $72.7 million in the first quarter of 2011. Mobile Computing revenue was $73.3 million, up 3% compared to $71.6 million in the first quarter of 2011. On a GAAP basis, gross margin was $44.8 million, or 29.8%, in the first quarter of 2012, compared to $39.5 million, or 27.4%, in the first quarter of 2011. Operating expenses were $44.4 million and earnings from operations were $0.3 million in the first quarter of 2012, compared to operating expenses of $48.9 million and a loss from operations of $9.4 million in the first quarter of 2011. Net earnings were $0.3 million, or $0.01 per diluted share, in the first quarter of 2012, compared to net loss of $7.8 million, or $0.25 per diluted share, in the first quarter of 2011. On a non-GAAP basis, gross margin was 29.8% in the first quarter of 2012, compared to 27.4% in the first quarter of 2011. Operating expenses were $39.7 million and earnings from operations were $5.2 million in the first quarter of 2012, compared to operating expenses of $43.2 million and loss from operations of $3.6 million in the first quarter of 2011. Net earnings were $5.0 million, or $0.16 per diluted share, in the first quarter of 2012 compared to a net loss of $2.4 million, or $0.08 per diluted share, in the first quarter of 2011. "Broad based revenue growth and improved gross margin drove stronger than expected financial results in the first quarter of 2012," said Jason Cohenour, President and Chief Executive Officer. "Overall I am very pleased with our Q1 results and trajectory. We have strengthened our operating model and have good visibility to growth drivers in both M2M and Mobile Computing." Non-GAAP results exclude the impact of stock-based compensation expense, acquisition amortization, restructuring costs, integration costs, foreign exchange gains or losses on translation of balance sheet accounts, and certain tax adjustments. We disclose non-GAAP amounts as we believe that these measures provide our shareholders with better information about actual operating results and assist in comparisons from one period to another. The reconciliation between our GAAP and non-GAAP results is provided in the accompanying schedules. The following Non-GAAP guidance for the second quarter of 2012 reflects current business indicators and expectations. In the second quarter of 2012, we expect revenue to increase on a sequential basis, driven primarily by growth in revenue from our 4G AirCard products. We expect gross margin to improve slightly and for operating expenses to increase slightly, compared to first quarter of 2012. Inherent in this guidance are risk factors that are described in greater detail in our regulatory filings. Our actual results could differ materially from those presented below. All figures are approximations based on management's current beliefs and assumptions. 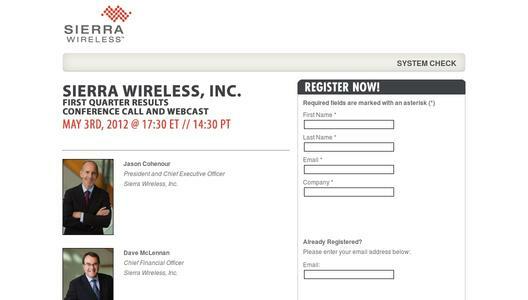 Sierra Wireless President and CEO, Jason Cohenour, and CFO, David McLennan, will host a conference call and webcast with analysts and investors to review the results on Thursday, May 3, 2012, at 5:30 PM Eastern Standard Time (2:30 PM PST). A live slide presentation will be available for viewing during the call from the link provided below. - Conference ID: 53772714 For those unable to participate in the live call, a replay will be available until May 11, 2012. Dial 1-855-859-2056 or 1-800-585-8367 and enter the Conference ID number above to access the replay. Certain statements and information in this press release are not based on historical facts and constitute forward-looking statements or forward-looking information within the meaning of the U.S. Private Securities Litigation Reform Act of 1995 and Canadian securities laws ("forward-looking statements") including statements and information relating to our financial guidance for the second quarter of 2012 and our fiscal year 2012, our business outlook for the short and longer term and our strategy, plans and future operating performance. Forward-looking statements are provided to help you understand our views of our short and longer term prospects. We caution you that forward-looking statements may not be appropriate for other purposes. We will not update or revise our forward-looking statements unless we are required to do so by securities laws. - Typically include words and phrases about the future such as "outlook", "may", "estimates", "intends", "believes", "plans", "anticipates" and "expects". - Are not promises or guarantees of future performance. They represent our current views and may change significantly. - Expected tax rates and foreign exchange rates. - Are subject to substantial known and unknown material risks and uncertainties. Many factors could cause our actual results, achievements and developments in our business to differ significantly from those expressed or implied by our forward-looking statements, including without limitation, the following factors. These risk factors and others are discussed in our Annual Information Form and Management's Discussion and Analysis of Financial Condition and Results of Operations, which may be found on SEDAR at www.sedar.com and on EDGAR at www.sec.gov and in our other regulatory filings with the Securities and Exchange Commission in the United States and the Provincial Securities Commissions in Canada. - The development and timing of the introduction of our new products may be later than we expect or may be indefinitely delayed. - Transition periods associated with the migration to new technologies may be longer than we expect. Sierra Wireless (NASDAQ: SWIR) (TSX: SW) offers industry-leading mobile computing and machine-to-machine (M2M) communications products and solutions that connect people, devices, and applications over cellular networks. Wireless service providers, equipment manufacturers, enterprises and government organizations around the world depend on us for innovative, reliable wireless technology. We offer 2G, 3G and 4G wireless modems, routers and gateways as well as a comprehensive suite of software, tools, and services that ensure our customers can successfully bring wireless applications to market. For more information about Sierra Wireless, visit www.sierrawireless.com. "AirCard" and "AirLink" are registered trademarks of Sierra Wireless. "AirPrime" and "AirVantage" are also trademarks of Sierra Wireless. Other product or service names mentioned herein may be the trademarks of their respective owners.